Buy All-in-one Epson L200 with original CISS and make 30 times more quality prints for the same money! Pay only 0.04 USD for A-4 full color print! We'd like to present you a new device in the В«Epson Print FactoryВ» series - MFP Epson L200. This model is positioned by its manufacturer as a multifunctional device with the lowest cost of color documents. Designed specifically for productional needs in a small business or in any other institution, the printer is equipped with the original CISS and a warranty of 6 months or 6,000 prints. A particular feature of this model is the Micro Piezo print-head, or so called piezo printing technology, which the Epson company has been famous for for a long time already. The maximal resolution is 5760x1440 dpi at printing speeds of up to 27 pages/min for monochromatic and 15 pages/min for color documents. It will take you more than one minute to print a 10x15 picture cm takes. The size of an ink drop is 4 pl. With its relatively modest performance the L200 Epson copes with basic office tasks perfectly. Contact scanner and copier, supplementing the main function of the MFP вЂ“ printing - will be invaluable when dealing with office documentation. Easy to install software will cause no difficulties even for a beginner. We advise those who have already been interested in this unit, to pay their attention to the model of the same series - Epson L100. The factory continuous ink supply system accommodates vessels with the capacity of 70 ml. According to the manufacturer - one filling should be enough to print 12000 black-and-white pages and 6500 colorful ones. Such a solution allows to save much on supplies, and the problem of ink consumption will touch you much more seldom. This model uses special dye-based inks for printing, it is worth noting that the manufacturer recommends to refill the CISS with original Epson ink only. We offer all the fans of high-quality color printing an excellent device Epson L800. This MFP has a relatively compact dimensions, so it can be easily placed to any workplace, and the practical design solution - quality plastic and mostly mat flutted coating protects it from undesirable scratches and fingerprints. Among possible types of PC-connection there is only a USB, located on the rear side of the case. The switchboard of Epson L200 is rather simple and consists of four buttons, responsible for such actions as: switching-on and -off power, monochromatic and color copying and cancel of the current operation. Besides there are LED-indicators, informing about the ink rate in containers, the availability of paper and electricity. 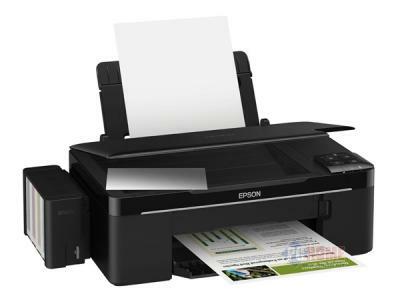 We can say that Epson L200 MFP, which eliminates all unnecessary stuff, is a pretty simple device, with no display, no various connectivity options, no card reader, etc., designed just for reliable and stable operation in office. The presence of built-in continuous ink supply system from the manufacturer allows to use original consumables much more economically and ensures high quality prints and great durability of your appliance.